Join Indigenous Services at the Gathering Place to learn more about Indigenous Drumming. Facilitator, Shemmaho Goodenough, an Elder Singer and drummer is a mentor teacher for Indigenous Songs. The songs we learn will arise from the needs of the persons participating. Please bring your personal hand drum if you have one. There are also some available to borrow. 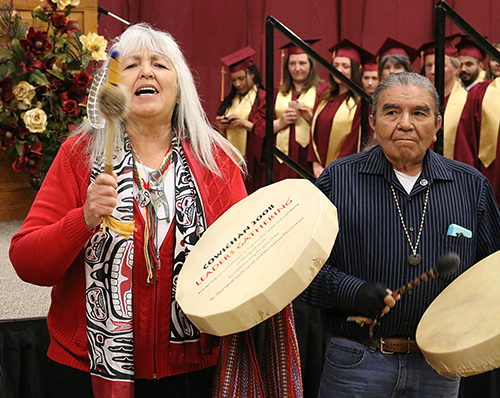 Donna Wright and Richard Armstrong participated in Selkirk College Graduation 2018 with song and drumming. All are welcome. Contact Tami O'Meara with any questions. Learn more about Indigenous Services at Selkirk College and follow them on Facebook.